When you close the door to your refrigerator and allow the temperature inside to rise, it becomes a mold-producing machine. The moisture and lack of ventilation in a refrigerator provide ideal conditions for mold growth, and some of the types that grow on food can be harmful; they produce toxins that cause allergic reactions and even cancer. 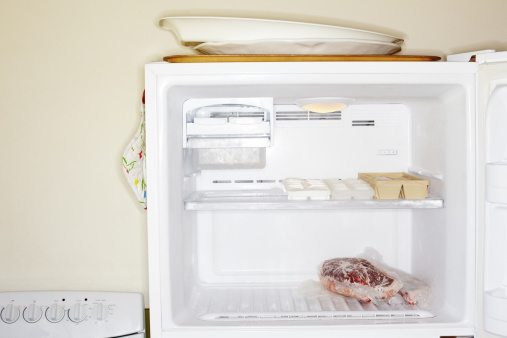 After throwing out your moldy food, clean out the refrigerator before restocking it. For years, government agencies recommended using chlorine bleach to clean mold and mildew -- which are words for the same thing -- but they have withdrawn that recommendation. Besides being corrosive and damaging to such parts of your refrigerator as the door gasket and plastic shelves, bleach isn't necessary. It does kill mold, but it doesn't penetrate porous materials, such as rubber, so mold spores that are buried deep in these materials can grow back. Removing moisture, keeping the temperature down and providing ventilation are better mold-control strategies. 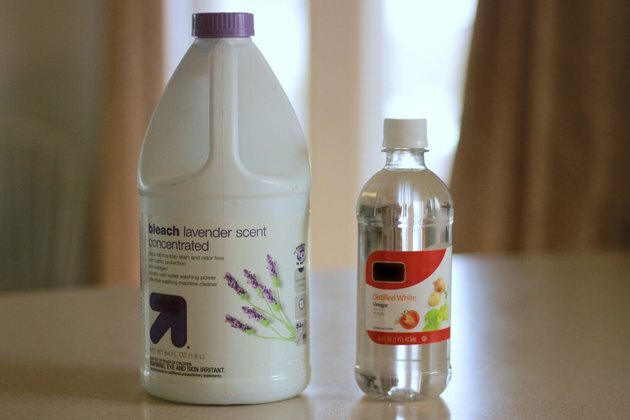 If you feel safer disinfecting, use vinegar, which does a comparable job and is safer. After emptying the refrigerator, remove all the shelves and wash them in the sink with detergent and water. Soapy water is the solution that government agencies, such as the Environmental Protection Agency, now recommend for cleaning mold. 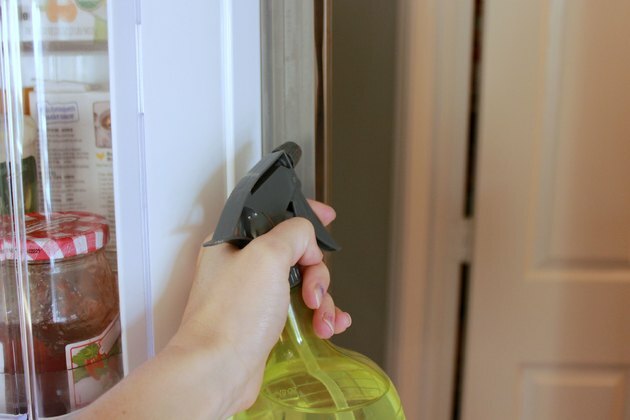 Use the same soapy solution to clean the inside of the refrigerator and freezer compartments. You may still notice a moldy smell, and if you do, it's probably coming from the ice or water dispenser. Clean all the tubes with vinegar and water, removing those you can and using a cotton swab to reach into orifices, such as the water dispenser faucet. If your refrigerator has an air filter, change it every three to six months to prevent it from adding to the mold problem. Mold particularly likes to grow on the door gasket and will do so even if the refrigerator is working and the inside is mold-free when the outside temperature is warm enough to support it. Instead of ruining the gasket by cleaning it with bleach, use hydrogen peroxide or vinegar, which are both safer and which both kill mold. Put full-strength hydrogen peroxide or vinegar in a spray bottle, spray the gasket, then wipe of all the blackening with a clean cloth. 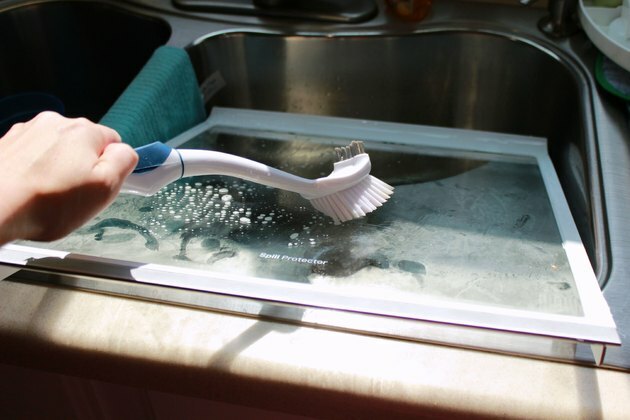 Use a toothbrush to reach under the gasket and scrub out the mold that's growing there. Rinse with clean water and leave the door open to let the gasket dry. 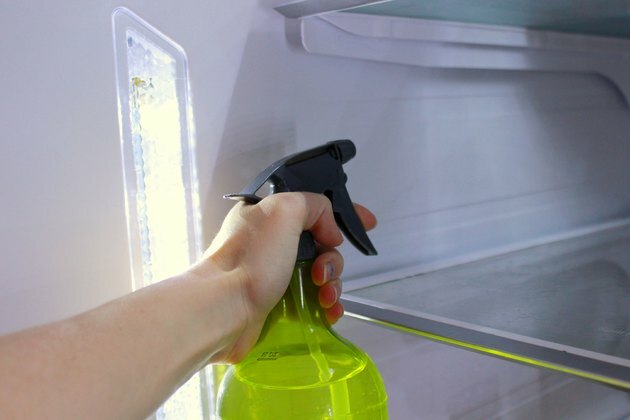 After washing down the interior of the refrigerator with soapy water and rinsing, spray the sides with full-strength vinegar to disinfect it. Allow the spray to stay on the surfaces for 10 minutes, then rinse it off with water. 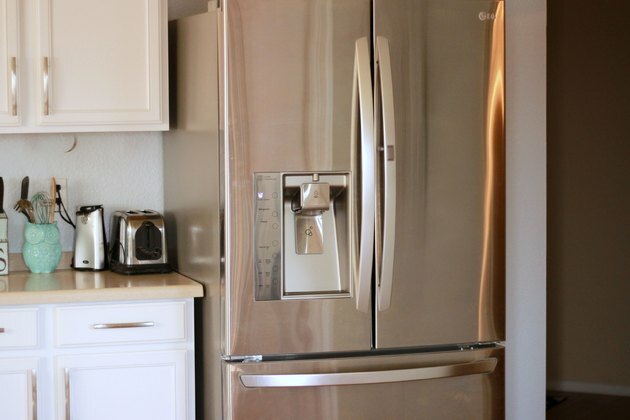 Let the refrigerator dry with the door open, then plug it in and close the door. If you put a bowl of baking soda or a few lemon wedges in the refrigerator, they'll take care of the vinegar smell. To prevent mold, always check the refrigerator for dripping water and wipe up any you find, and keep the unit plugged in. The low temperatures and ventilation provided by the air circulation fan will keep mold at bay.